In previous posts, I have discussed Questions 1) and 2) with the answers that 1) I think that getting people to eat insects will not be an insurmountable barrier and 2) there are specific concerns that must be addressed to assure people that the insects that they are eating are of proven (vetted) food value and that they are safe in accordance to food safety guidelines. I expressed special concern about getting right the analytical methods that provide information for food labels (proximate analyses) of insects to be used as food AND I suggested that careful scientific experiments needed to be done to demonstrate the efficacy and bio-availability of insects on a per case basis (i.e., what we learn about how bio-available cricket protein may be for humans does not translate exactly to the bio-availability of mealworms or some other insects. This leads to my third question from the paragraph in the original blog post on eating insects: gathering vs. farming. Some Basic Questions and Organizing Principles: 1) Will social or cultural constraints make it unrealistic to use insects as human food? 2) Does the food value and food safety of insects impose impossible constraints? 3) Will gathering insects from nature allow us to make a significant “dent” in the needs for human food? 4) Will systems of farming insects become feasible to make significant advances in the use of insects as human foods? 5) How far can insect mass-rearing go towards allowing us to produce enough quality insect biomass to have a significant impact on the growing needs for food? In the FAO-sponsored paper by van Huis et al. 2013, the authors make a case for the wide-spread acceptance and cultural tradition of using insects as food for people. The photographs in this publication are dazzling, and the presentation of the insects makes them most appetizing. However, most of the insects depicted in this paper are gathered (harvested from nature or as side-products from agriculture. At this level of making insects available, there is total dependence on existing populations of insects, just as fishing and hunting are used to provide human food from the oceans, fresh water, and from the wild, in general. Clearly there problem with reliance on gathered insects will meet with the same barriers that fishing and hunting have met when human populations rose to levels that exceeded the supply from nature alone. Of course, this gave rise to agriculture. So the next step that far-thinking “insects as food advocates” suggest is agricultural production of insects: farming insects to be used as human food. There are several possible forms of “insect farming:” 1) field operations where production takes place in agricultural fields or in greenhouses, 2) production of feeder insects as side-products of existing programs or insect production that is in place with other functions, and 3) in systems where insects are reared for food purposes as the primary goals. Producing edible insects as a field operation: often our mono-culture system of agriculture results in production of large biomasses of insects that are pests in our crops. So a possible avenue for mass-production of insects in the field could be a controlled locust swarm where an optimized crop of grass could be grown to deliberately serve as a food for locusts, which would be harvested at appropriate times. Buildups of locusts and other crop pests take place NOT under human control. If the pests’ biology could be better understood with all the conditions that lead to massive pest outbreaks managed, this could be a low-input form of insect farming. Obviously, this is a speculative issue, and much, much more understanding of the natural cycles of pest build-up must be developed. The production of feeder insects as an outgrowth of existing insect production systems has the advantage that a substantial base of knowledge exists for producing certain kinds of insects. Silkworms have been domesticated for 5000 years, and their mass- production for silk has long been a practice throughout Asia and more recently, the Middle-East and parts of Europe (and even in the Americas to a limited extent). It happens, too that silkworms are already a well-accepted food for people, and the pupae, once they have spun their cocoon, can be harvested for food for people. 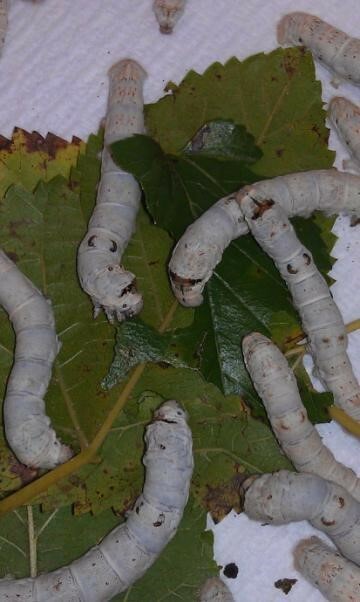 If the cost of producing silkworms were further reduced with an artificial diet technology that could replace the mulberry with a cheaper food while retaining the mulberry flavor with an extract, it is possible (though challenging) to greatly increase silkworm production, make silk less expensive, and make considerable biomass of tasty silkworm pupae available. Honeybee drones have been used as as food for people and other organisms, and the cost of producing drones is supplemented by the use of honeybees as 1) pollinators, 2) sources of honey, 3) sources of wax, and 4) other products that can be value-added ALONG WITH DRONES AS HUMAN FOOD. Again, like with silkworms, this possibility would call for development of technology that would reduce the cost of amplifying bee populations. In light of the current problems with colony collapse disorder (CCD), this prospect seems challenging, but I feel that too little is understood about nutritional replacements of pollen and nectar, so I can see a possible increase in honeybee production. Some other insects that are currently produced as feeders, include crickets and meal worms, drosophilid flies, horn worms, among others. Improvements in mass-rearing these and other potential feeder organisms, can result in reduced costs of production of feeder insects for human food. This topic requires far more discussion, some of which I will do in a future blog post. It should be noted that only a few researchers have treated with actual scientific studies the topic of the efficacy of the production and use of feeder insects as human food: this leaves most of the considerable attention that has been given to this topic in the category of speculation. An example of what I mean by scientific studies is the Lundy and Parrella (2015) paper titled, “Crickets are not a free lunch…:” These authors did a systematic study of utilization of various quality foods by crickets (Acheta domesticus). Statements in the popular literature, on websites, and in proposals for funds to support enhancement technology for producing crickets (and other feeder insects) on low quality foods, including portions of waste streams. Lundy and Parrella showed that the claims by many insects as human food advocates that crickets have a tremendous potential for turning low quality foods into high quality, high nutrient insect biomass. These authors showed that there are definite limitations to crickets’ ability to make the kind of conversions that they are often touted to make. I will treat this concept of how much we should expect from insects to make the nearly magical transformations in a near future blog post on the virtually alchemy expectations that are touted for insects. van Huis A, van Itterbeeck J, Klunder H, Mertens E, Halloran A, Muir G, et al. Edible insects: future prospects for food and feed security. No. 171. Food and Agriculture Organization of the United Nations (FAO), 2013. 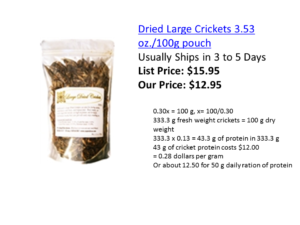 Price of crickets available online. The cost of a 50 g ration of protein (recommended by FAO/WHO for human adults) is about $12.50 US dollars. In the previous blog page on this topic, I gave an overview of the potential for using insects as human food to make a significant impact on the goal of meeting the growing need for food for a population of humans that is expected to rise from about 7.5 billion in 2016 to more than 9 billion people in 2050. I introduced the following paragraph and I answered the first question about whether enough people would be willing to accept a new food source to make a difference. I answered this affirmatively, meaning that based on current cultures and anticipated needs, people WILL be willing to eat insects as a significant part of their diet. Now, reminding the reader of the overview paragraph, I will discuss the second question. Although standards will differ from country to country and the influence as such organizations as FAO (Food and Agriculture Organization of the United Nations) and WHO (World Health Organization)–(not to mention such organizations as the USDA and the US Food and Drug Administration will provide guidelines or regulations, the issues of food value of various insects and food safety of insects intended to be incorporated into the human food chain must be much better understood than they are currently. 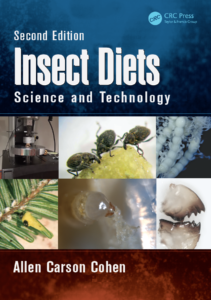 As for food value of various insects, a very well-cited work is the paper by M. D. Finke (2002) which provides proximate nutrients (gross composition of proteins, lipids, carbohydrates, and minerals) of several commonly used feeder insects. Other papers are appearing with increasing frequency in both entomological journals as well as food science journals. The papers of Longvah et al. 2011 and Zhou and Han 2006 are good examples of nutritional analyses of insects currently eaten by people. However, an important caveat is that there is a disparity between what is IN the insects versus what is AVAILABLE to a person eating the insects. The concept of bioavailability is still poorly explored, though papers such as the one cited here by Xia et al. (2012) tackle the question of how well a target organism can access the nutrients. The topic of factors that govern bioavailability, though fascinating, is too involved for the current blog entry. I treat this in more detail in my book (Cohen 2015), but suffice it to say that not all nutrients can be accessed equally well: so a protein that may be present in an insect may not get digested or absorbed because it is surrounded by indigestible cuticle, or it may have a sequence of amino acids that defies digestion. The same question of bioavailability applies to other nutrients such as vitamins and lipids. Testing the bioavailability and other aspects of food value of insects requires very specialized expertise, and even if a rat or rabbit model is used, the results may not translate into the human context. One more point about proximate analysis (something like the food labels on peanut butter or milk cartons): the methods and competency of analysis are very crucial. I have seen several treatments of insects’ food value presented, and when difficult to measure nutrients such as proteins are presented, there is often an over-estimation of the amount of protein present. When researchers use standard methods such as elemental nitrogen, they are NOT directly measuring the actual protein. For many foods (soy products, milk, vertebrate-derived meats, for example), using elemental analysis of total nitrogen and multiplying by a correction factor gives a good estimate of the protein value of that food. HOWEVER, in insects, total nitrogen (elemental nitrogen) does not reflect exactly the true protein content due to false elevation of nitrogen levels such as the nitrogen in the cuticle and nitrogenous wastes like uric acid, which all give a value that increases the nitrogen but does not increase the protein. This point has long troubled me because it causes an inflated value for the protein in most insect species. The other point here is that the quality of the protein is not reflected by the elemental nitrogen analysis. Low quality proteins that are poor in some of the essential amino acids would give a false high score in a protein evaluation. Therefore, the appropriate analytical evaluations and interpretations are absolute essentials in judging the food value of insects for people. The other issue of food safety raises many more questions that can be very challenging. For example, crickets which are commonly used by entomophagy enthusiasts can carry lots of potentially dangerous microbes, and the concept of using soldier flies fed poultry feces brings with it challenges to deal safely with the Salmonella and other gut microbes know to be present in poultry. Several websites exist that provide recipes for insects, and some of them are very responsible about suggesting that the insects be cooked by blanching in boiling water for at least two minutes. These types of standards must become firmly established, vetted, and publicized before the questions of food safety can be put to rest. 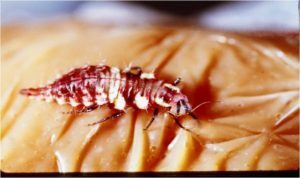 This is only a cursory discussion of the issues of food value and food safety, but they are ones that current and future insects as food enthusiasts must be prepared to address. Finke, M.D. 2002. Complete nutrient composition of commercially raised invertebrates used as food for insectivores. Zoo Biology, 21(3): 269–285. Longvah, T., K. Mangthya, and P. Ramulu. 2011. 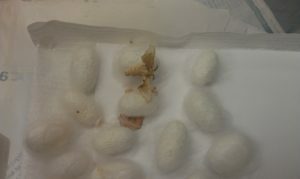 Nutrient composition and protein quality evaluation of eri silkworm (Samia ricinii) prepupae and pupae. Food Chemistry. Food Chemistry 128: 400–403. Zhou, J. and D. Han. 2006. Proximate, amino acid and mineral composition of pupae of the silkworm Antheraea pernyi in China. Journal of Food Composition and Analysis 19: 850–853. Xia, Z., S. Wu, S. Pan, and J. M. Kim. 2012. Nutritional evaluation of protein from Clanis bilineata (Lepidoptera), an edible insect 58J Sci Food Agric. 92: 1479–1482. The prospects of using insects as human food to meet future needs of a growing world population has become a topic of lively discussion. For example, van Huis (2013) and van Huis et al. (2013) provide arguments about the benefits of what has come to be called “entomophagy” or what I call “entomophagy by humans” in light of my experiences with the many instances when entomophagous animals other than humans are discussed and studied. And, in fact, in the mix of proposed uses of insects as livestock feed and as human food has stimulated considerable discussion and some research. I have reviewed some of the papers on insects as human food in the 2nd edition of my diet book, but I did not cite an important and very thoughtful paper by Lundy and Parrella (2015) on the ability of crickets (Acheta domesticus) to capture protein from various diets, including waste streams. Spoiler Alert: I approach this subject with skepticism. I think that the excitement about really meeting the needs of the growing human population with insects as a significant source of food (or protein, as it is popular to say is somewhat irrational—at least based on our current state of knowledge. I will be spreading my discussion over several blog posts on this site. 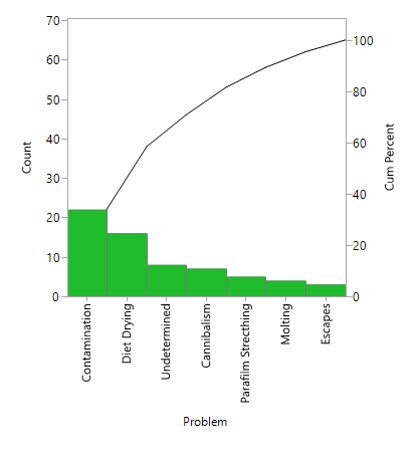 I realize that my answers to the above questions may be discouraging to insects-as-human-food enthusiasts, but I hope that the critical thinking that I am offering will stimulate thought and perhaps help the entomophagy enthusiasts be more prepared to succeed in their enterprise by having a realistic understanding of possible problems. So in answer to the first question about whether or not people will accept insects as food, I see no question about this. First, people have been eating insects in various cultures worldwide, using locally abundant insects with a great variety of preparation techniques. Second, there is an increasing effort to render insect nutrients (especially insect proteins) into processed materials such as meal worm meal, cricket flour, and so on. 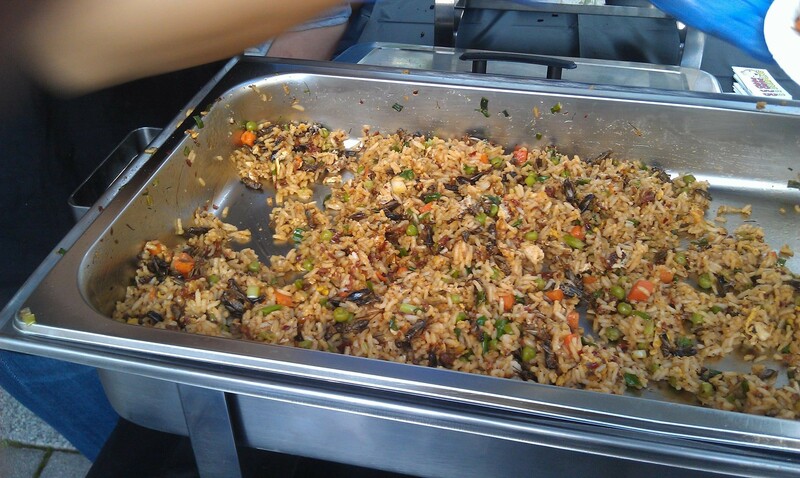 The processing can concentrate and possibly improve the food quality and simultaneously disguise the insect components. So a meal worm bread that contains flour made from drying and grinding meal worms can go unnoticed in a person’s meal. 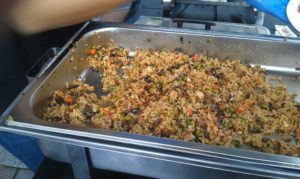 The enthusiasm for insect-eating can be seen at the annual Bug Fest in Raleigh, North Carolina where hundreds of people line up to get dishes prepared by local restaurants where the chefs have incorporated insects into savory dishes. The video above shows some of this, and the cricket stir fry photo help make this point. People can learn to eat insects just as they have other arthropods such as shrimp, crabs, lobsters, and crayfish. *I have borrowed the term from Alan Greenspan, chairman of the Fed, and a term which Greenspan is said to have derived from Yale Professor, Robert Schiller (https://en.wikipedia.org/wiki/Irrational_exuberance). Cohen, A. C. 2015. 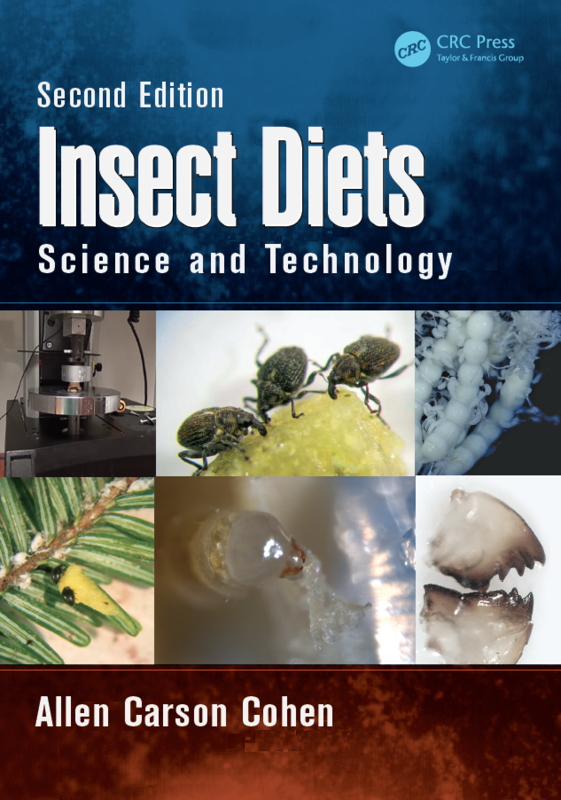 Insect Diets: Science and Technology. 2nd Edition. CRC Press. Boca Raton, FL. In this case, we found that 22 deaths could be attributed to mold in the diet, 16 deaths from diet drying out, and cannibalism, poor stretching of the Parafilm membrane preventing the proper feeding seen in the upper right diagram, problems with molting, and escapes accounting for other loses. In 8 containers, the causes of failure were not determined, possibly unseen pathogens or genetic defects. The point here is that once we had collected data on the most likely causes of loss and the relative frequency of these causes, we could launch an effort to correct the problems, and clearly dealing with contaminants would be the most fruitful in improving our rearing outcomes (since nearly half the loses came from contamination. This data-driven conclusion was based on the Pareto analysis, which is a simple tool that helps to shape decision-making about rearing system improvements. This simple example tells us these things (take home messages): 1) collecting data is where to start, 2) using the expertise that is available is helpful in deciding what data to collect and how to interpret (e.g. how do we know how to recognize mold or desiccated insects? ), 3) analysis of the data with graphic techniques can be very useful. In a soon to be posted blog, we will cover some approaches taken to improve the problem with straggling in the Forest Service gypsy moth colony at Hamden, CT back in the late 1980’s (see ODell 1992 below). It’s an excellent example of problem-solving approaches. Boller, E. F., B. I. Katsoyannos, U. Remund, and D. L. Chambers. 1981. Measuring, monitoring, and improving the quality of mass-reared Mediterranean fruit flies, Ceratitis capitata Wied. 1. The RAPID quality control system for early warning. Z. angew. Entomol. 92: 67-83. Calkins, C. O., K. Bloem, S. Bloem, and D. L. Chambers. 1994. Advances in measuring quality and assuring good field performance in mass reared fruit flies. Pp. 85-96. In C. O. Calkins, w. Klassen, P. Liedo [eds. ], Fruit flies and the sterile insect technique. CRC Press. Boca Raton, Florida. U.S.A.
ODell, T. M. 1992. Straggling in gypsy moth production strains: a problem analysis for developing research priorities, pp. 325-350. In T. A. Anderson and N. C. Leppla [eds. ], Advances in insect rearing for research and pest management. Westview, Boulder, CO.
All processes, regardless of their purpose, are subject to variability or error. Insect rearing, as a process, is subject to variability, and that variability is often the basis to failures in our systems. We will cover in other blog posts and discussions on this site more of the details of the importance of variability (error) in rearing systems, and we will suggest ways to deal with it to ameliorate some of the error-caused problems. 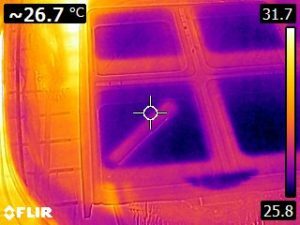 For now, we will use an example of thermal variability in rearing systems. These images were captured in my rearing room where I am testing some innovations in diets for tobacco hornworms (Manduca sexta). 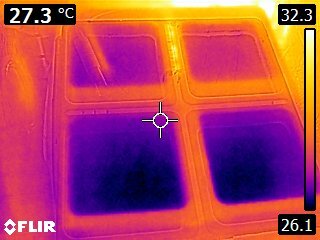 The first figure is a thermal image of 3 rearing cages that contain diets that were poured into 8-cell plastic rearing trays. All 3 cages are on the same shelf, side-by-side. 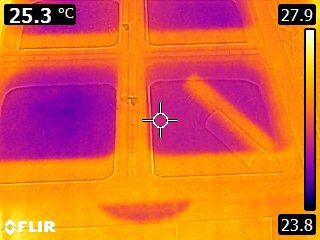 We opened each container and captured the thermal profile of each. Reading these thermal Images: each image includes a range of colors where (in these images) dark blue is the cooler temperatures, and yellow/white depict the higher temperatures. Also, the scale at the right shows a key to the temperature scale, and in the upper left corner the temperature of the region within the circle is presented. So in the top image, the edge of the center rearing container is circled, and the temperature is 26.7 o C.
First, let us establish that the cylinders in each of the containers are glass tubes used to hold eggs and release neonates to infest the diet. Please note that the temperatures in each container follow a thermal gradient and are characterized by a 4 to 6 degree C range of temperature; and furthermore the diets are always cooler than the plastic sides of the diet tray. 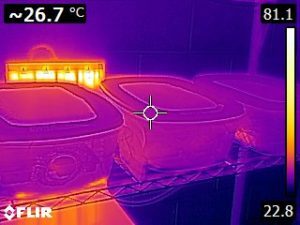 In container 1, the diet’s surface temperature (where the insects are feeding) ranges from about 26 C to about 28 C. This is quite different (in terms of temperature) from container 3 where diet in the lower right hand cell is about 25.3 degrees C. Therefore, despite the fact that the insects are being held in the same types of containers on THE SAME SHELF in the rearing room, there is chronic (continuous) exposure to temperatures that are at least 1-2 degrees C different from one-another. Knowing how important temperature is as a growth/metabolic determinant, it is clear that we have inadvertently imposed a temperature factor in the rates of growth–a factor that is going to cause an error that detracts from our interpretation of the diet evaluation! Take home message: nearly every factor/component in our rearing systems has an inherent variability (error). If we recognize these factors/sources of error and try to correct them, we will improve our rearing process (i.e. we will CONTROL it). Happy 57th Anniversary, Wheat Germ in Insect Diets! 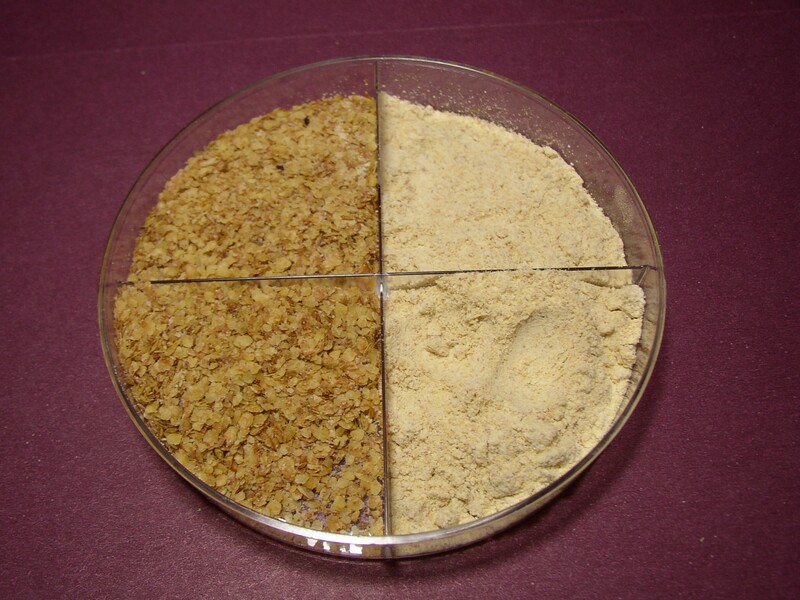 Wheat germ from two different sources: which one is best for your diet? The power of wheat germ as a diet component: a revolutionary breakthrough! There is no way to express the magnitude of influence that the introduction of wheat germ has had in the science of entomology and in related disciplines. There have been huge scientific, economic, ecological, and social impacts from this remarkable innovation since its introduction more than 57 years ago. More than 1000 citations of the rearing paper on Manduca sexta (the tobacco hornworm) have been made for this paper: Bell, R. A. and F. G. Joachim. 1976. Techniques for rearing laboratory colonies of tobacco hornworms and pink bollworms (Lepidoptera-Sphingidae-Gelechiidae). Ann Entomol. Soc. Am. 69: 2: 365-373 and nearly 300 more citations refer to the original M. sexta rearing paper from which the Bell and Joachim diet is derived (Yamamoto, R. 1969. Mass rearing of the tobacco hornworm: II. 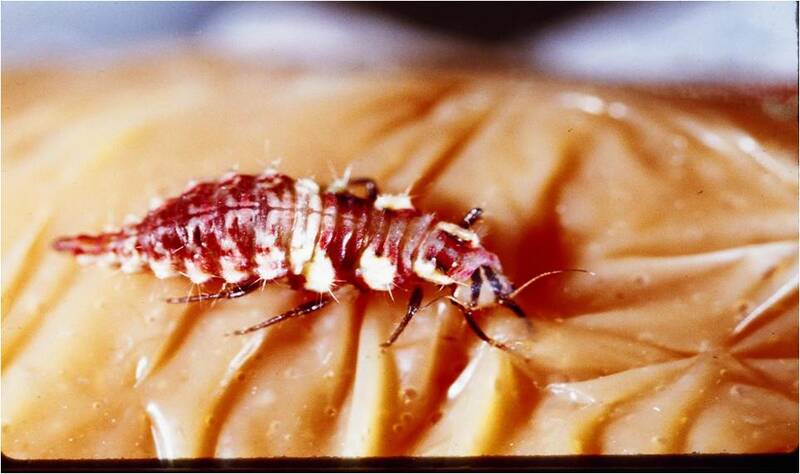 Laval rearing and pupation. J. Economic Entomol. 62: 1427-1431. Besides these 1,300 references to the tobacco hornworm diet, there are thousands of other papers that refer to wheat germ as a principal component of diets for scores of other insects, and beyond the research/ scientific scope of wheat germ influence in insect diets, programs such as the pink bollworm sterile techniques program and many other mass-rearing programs depend hugely on wheat germ. This would make the influence of the wheat germ diet have an impact of billions of dollars over the years since this deceptively simple-sounding advancement was made in 1959. How did wheat germ get introduced into insect rearing? The great USDA, ARS scientist, Dr. Erma S. Vanderzant (January 30, 1920-November 2, 1999) was a biochemist who worked at the College Station USDA Laboratory associated with Texas A&M University. She had worked for years on diets for cotton insects, including boll weevils, pink bollworms, Lygus bugs (western tarnished plant bugs), and to a lesser extent, green lacewings. She laid down many of the nutritional and biochemical fundamentals of these insects, and in my opinion, she never fully received the full credit for the amount of advancement that her meticulous and insightful studies had provided our community. An inauspicious start for wheat germ! In 1959, Dr. Vanderzant and her colleagues published a paper on feeding and oviposition of boll weevils (Vanderzant, E. S., C. D. Richardson, and T. B. Davich. 1959. Feeding and Oviposition by the Boll Weevil on Artificial Diets. J. Econ. Entomol. 52: 1138-1142.) In that paper, wheat germ was shown to be of unspectacular value in one of several diets, but it had one distinguishing quality: it served as an oviposition stimulus: something that had been problematic to the several researchers trying to mass-rear boll weevils without using host materials (cotton bolls or extracts from cotton bolls: it was the efforts that Robert T. Gast had made to extract cotton bolls that led to his untimely death resulting from an explosion of an autoclave during a solvent-based extraction process at the USDA, ARS boll weevil lab in Starkville, Mississippi). But for some reason, Erma Vanderzant and some of her colleagues decided to try wheat germ in the diet of pink bollworms, another cotton pest that had proved elusive to development of really practical diets that would economically and reliably support development of multiple, continuous generations of “pinkies” for sterile release and other management programs. The results of this work were published the year after the debut of wheat germ in this paper: Adkisson, P. L., E. S. Vanderzant, D. L. Bull, and W. E. Allison. 1960. A wheat germ medium for rearing the pink bollworm. J. Econ. Entomol. 53: 759-762. As the saying goes, “the rest is history.” The application of wheat germ to “pinkie” diets was such an impressive success, that hundreds of other authors followed the teachings of Erma Vanderzant about the wonderful efficacy of wheat germ as a major component in insect diets. In the nearly 60 years since the advent of wheat germ in insect diets, we have come to understand SOME of the properties of this material that makes it such a suitable diet factor, but there is much more that needs to be understood. I strongly advocate the exploration of the reasons WHY wheat germ is so helpful to insect feeding efforts, and I will discuss some of these questions in near future postings on this site. Now available: Insect Rearing Online Course! An ideal course for people new to insect rearing or with limited experience. This course is available as a NOT FOR CREDIT introduction to rearing, including the biological aspects and physical aspects of rearing systems. You learn at your own pace, and you have access to the instructor, Dr. Allen Carson Cohen. You get feedback from brief quizzes and from interactions with Allen Cohen. We are pleased to announce that our updated and improved online course in insect rearing is now open for registration. The information about how to register and some highlights of the course is below. Please note that among the changes from the online courses that we offered previously, we have everything in the introductory course included in one package, for which the registration fee is $400.00. This fee gives you access for 12 weeks to all 66 course modules and supplements. See our Course Outline page for further details. All modules are followed by objective, self-graded quizzes, but students are invited (but not required) to write some short essay responses about course information. We are sure that this course can be of great value both to people new to rearing and to experienced rearing personnel. The format of PowerPoint presentations, narration (by Allen Carson Cohen), videos, and feedback from quizzes and email communication makes the course unique and a great value. And, of course, if you are having problems or have questions, you can contact Allen Cohen (accohen@ncsu.edu). 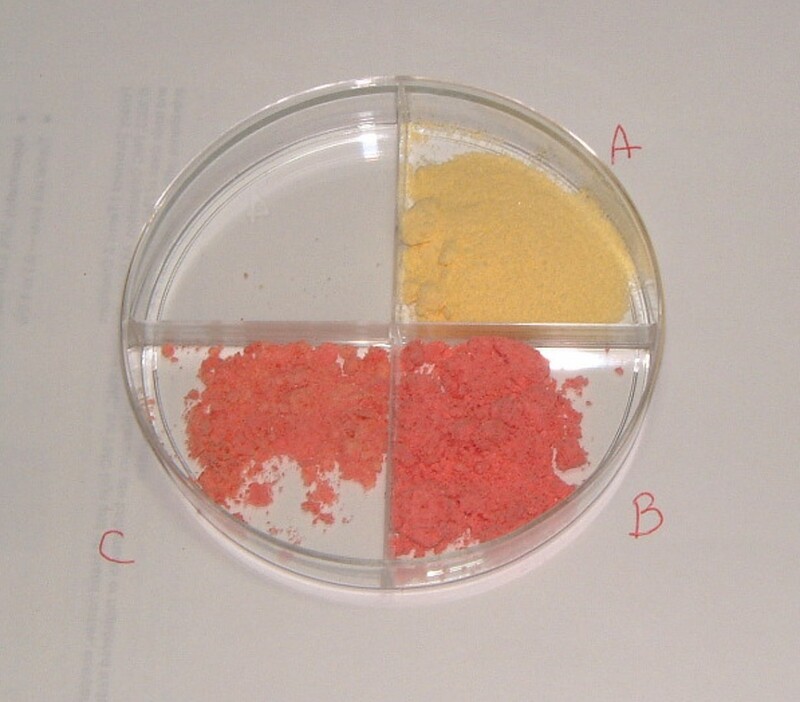 Represented in the photograph are three samples of Vanderzant vitamins, A and B obtained from a different supplier, C being from the same batch as B but having been stored at room conditions for two weeks. In neither product was the reference cited as to which mixture was being used, but the most widely used formulation is that of Vanderzant (1973), cited below. The formulation of that mixture is provided in the table below. However, it remains problematic for me to reconcile how two mixtures with identical names (“Vanderzant vitamins”) can be so dramatically different in appearance—one being obviously reddish-pink the other being conspicuously yellow! I am refraining from citing the sources of the vitamins, but I must point out that in the formulations that I have published, I have always used the pink mixture (e.g. Cohen 2000, 2003, 2015), and recently I have become aware that the yellow version existed. The pink to red color of the vitamin mix can be attributed to the color of vitamin B12, which contains the element cobalt. Something that is not entirely clear to me is the basis of the red/pink/yellow colored alternatives, but it raises questions for me as to whether the two vitamin mixes are fully equivalent. As a possible explanation for the color differences, please consider the following: there are several forms of what is called B12 or cobalamin and one of the alternately-used forms of B12 Cyanocobalamin is frequently used in vitamin supplements because of its superior stability over the simple cobalamin form. In an internet article about B12 ( https://en.wikipedia.org/wiki/Cyanocobalamin) it is mentioned that various reduced forms of Cyanocobalamin, with cobalt present as Co(I), Co(II), or Co(III) appear nearly colorless for Co(I), yellowish for Co(II) and pink for Co(III). I have posted here two comparisons of profiles of formulations that I found in an internet search of the term, “Vanderzant vitamins.” The 3rd formulation (not pictured here) represents itself as a modification, and two conspicuous differences are in the content of vitamin E or alpha-tocopherol and in the type of sugar used (sucrose, instead of glucose). One further point that bears thinking is the faded appearance of sample C in Figure 1. The vitamins in C are from the same batch as B, except that the materials in C were stored at room temperature and with light exposure for two weeks. How much does the color change reflect deterioration of potency or quality of the vitamins? The natural question raised by these conspicuous differences is how much can we rely on the equivalency of each formulation? It is logical and reasonable to assume that any deviations from a prescribed, tested formulation can lead to differences in the performance of our target insects; and experience teaches us that very often differences often lead to harmful or undesirable results. I frequently tell my students that any changes in the rearing setting may be 1) harmful, 2) helpful, or 3) neutral, and the only way to tell which way these changes will affect our target insects is by empirical tests—side-by-side controlled experiments with the questionable variable and the standard (control) form rigorously compared. Vanderzant, E. S. 1973. Axenic rearing of larvae and adults of the boll weevils on defined diets: additional tests with amino acids and vitamins. Ann. Entomol. Soc. Am. 66: 1184-1186. Cohen, A. C. 2000. New oligidic production diet for Lygus hesperus Knight and L. lineolaris (Palisot de Beauvois). J. Entomol. Sci. 35: 301-310. Cohen, A. C. 2003. Artificial diet for arthropods (continuation in part). U.S. Patent 6,506,597. January 14, 2003. Beck Salt (Mineral) Mixture (I have withheld the supplier’s name for the sake of discretion). The list of components told me that the mixture contains sodium, iron, manganese, zinc, copper, calcium, magnesium, and their counter ions such as chloride, sulfate, acetate, and phosphate, but it tells me nothing of the concentrations. I wrote back to the supplier, including my comments on the importance of the relative amounts of these minerals (salts) in the “Beck salts” that they supply, and I included a reprint of the paper by Retnakaran and Beck 1967, but I never got an answer to the question about the concentrations of each component in the list that I copied above. Evidently, the supplier considers the question of proportions of the mixture of insufficient importance to provide the answer to my question. In my inquiry, I conceded that if the mixture was proprietary, then it should not be referenced as a “Beck salts” mixture and that if the mixture was actually made by some other supply source, that supplier should be willing to fully describe their product. I will write more in a future blog article about the nature of salts and their counter-ions and other characteristics, but clearly for the present article let me simply emphasize the importance of diet and rearing professionals knowing and understanding the complete nature of the mixtures that they use in diets. What I have discussed here is a very specific example of how people who rear insects and often people who supply the rearing personnel with diets, diet components, or other rearing materials do not sufficiently take seriously the importance of what may seem to be minor matters. I have heard many well-meaning rearing professionals express shock and dismay that suppliers may make changes in the rearing components they depend upon for quality. Another assumption commonly held by rearing personnel is that there is an exact set of characteristics of diet or other rearing system components, and it is assumed that when we buy a brand of agar, salt mixture, wheat germ, or other material there is a sameness from one batch to another. This assumption of sameness or “standardness” does not always hold up, and in my nearly 4 decades of rearing experience, I have seen dozens and dozens of instances when an otherwise stable rearing system crashed or manifested problems in the quality and quantity of their insects. If my posts and other efforts to help us improve rearing raise the consciousness of rearing personnel about the importance of careful adherence to process control standards, I will have done something of value to rearing professionals and their stakeholders. Hello people in the insect rearing community. 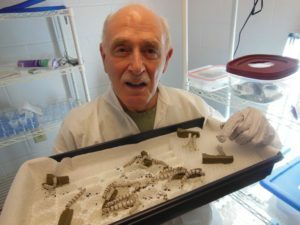 This is Allen Carson Cohen (aka, Allen C Cohen or Allen C. Cohen) announcing the new website and blog about insect rearing. Please come to this site to find out more about what we are doing to enhance insect rearing as a science and technology. We do education and research in the field of insect rearing. 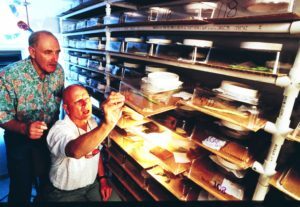 I plan to offer a daily blog with comments and my thoughts about insect rearing, often with ideas from my current and past work with rearing systems and my interactions with rearing professionals. I will also offer instructional materials and ideas for helping to make our rearing profession better able to serve the world.